IBC2017 will be celebrating its 50th anniversary, truly golden, and this year's Innovation Awards categories have been updated to reflect the changing industry. The three awards will be presented for the most innovative projects in content creation, content distribution and content everywhere. ONE Media, TeamCast and their end-user, Sinclair Broadcast Group (SBG) have jointly submitted an entry for the IBC content distribution award. The award entry highlights the Next Generation of Broadcast Platform project as conducted by ONE Media and Sinclair Broadcast Group. This project reconsiders the traditional way of deploying and operating a Terrestrial Broadcasting Network. One major difference is the implementation of a “standard agnostic” transmitting technology as implemented by TeamCast. Beyond conceptual definition, development and laboratory experimentation, SBG has validated this promising concept in real life, over the air testing with the support of ONE Media and TeamCast. This ATSC 3.0 Single Frequency Network Baltimore experiment, which started in March 2016, quickly turned into a first deployment during the second quarter of 2017, with the addition of a third transmitter, allowing SBG to refine the field experiment and acquire the enriched experience needed for the nationwide deployment to come. On June 19, 2017, this Project was placed on the short list for the IBC Innovation Award, in the Content Distribution Category. The winners of these three awards will be announced during the IBC2017 Awards Ceremony, at 18:30 on Sunday 17 September, in the RAI Auditorium (Amsterdam / The Netherlands). Mark Aitken, VP of Advanced Technology for Sinclair Broadcast Group, said that Sinclair has long advocated evolving Terrestrial Broadcast to an all IP data network. Working with TeamCast and ONE Media, they have taken a significant step forward in defining an architecture that enables Terrestrial Broadcast to fulfill its promise. Being identified by IBC for this advancement is an honor, and they am proud of their team and the hard work they have accomplished to make this happen. Kevin Gage, EVP of Strategic Development and CTO of ONE Media added that it has been a pleasure working with the TeamCast and Sinclair teams to realize their vision of a modern broadcast broadband distribution architecture. 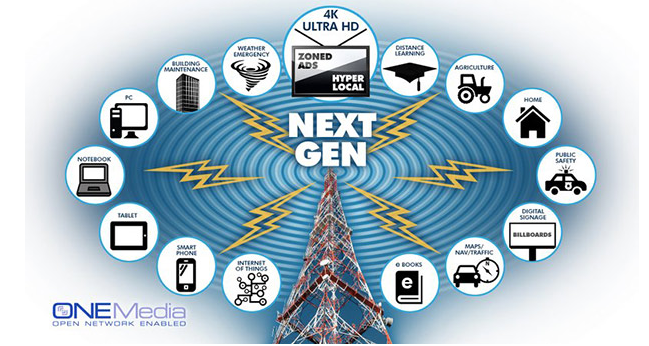 The new architecture will enable terrestrial broadcasters the flexibility to provide new service capabilities in addition to their core television service to meet rapidly changing market dynamics. They are honored that IBC recognizes the value of this work to serve terrestrial broadcasters’ future needs. Eric Pinson, Business Unit Manager at TeamCast remarked that they are very proud and honored of being shortlisted for the prestigious IBC Innovation Award alongside SBG and ONE Media. This highlights a growing interest for this very new innovative and non-traditional way of designing, deploying and operating a Terrestrial DTV infrastructure. One of the key challenges for TeamCast designers has been to implement the centralized network architecture concept, as required for this project, onto a turned-key and ready-todeploy solution.